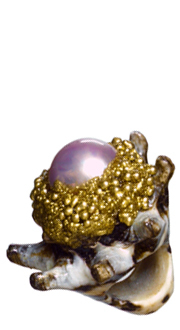 With her first jewelry collection, self taught designer Mesi Jilly offers a range of unique luxurious handcrafted shell-based rings that combine semi-precious stones, mother-of-pearl and coral with gold or silver. Each ring is one-of-a-kind and is a veritable work of art. The collection offers simple and elegant spiral shells to oversized stone-encrusted shells. Designed by Mesi Jilly and handmade in Italy by artist/jeweler Stefano Zuolo, the line of luxurious rings they created can be as easily worn on the beach as at a beautiful cocktail party. The rings reflect Mesi's personal style which combines a casual-chic look accessorized by one strong piece of jewelry. 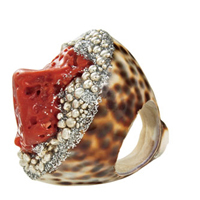 Her love for the ocean inspired her to create these shell rings for her first collection. "I absolutely love the ocean and to spend time at the beach. I am fascinated by seashells and making jewelry has always been my dream. That's why I wanted to combine these interests and create something unique, something very special, something that will be a beautiful reminder of warm and fun-filled summer days and nights."